A glossy full-color postcard is a great way to advertise your business or product. 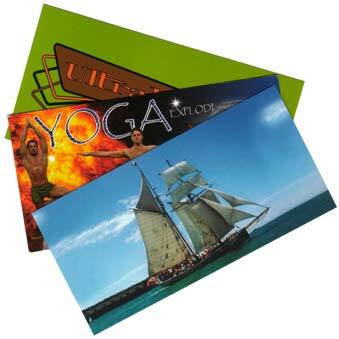 Postcards can be used to sell to your customers to help them remember you and of course to advertise to their friends when they send them. For larger quantities and different sizes please request a quote. Print Area Size: Various please ask. If you would like further information on this great product or to request samples please feel free to contact us. We received our postcards a day or so ago, and we are just thrilled with your superb skills in producing just what we wanted. We’re sure our guests will be just as delighted to receive such a lovely parting gift as they leave our homestay and when they are posted, will give us good advertising exposure as they travel around the world. Thank you also for the gifts of notepads – what a good idea! All in all, your company has certainly delivered the goods with a very professional product at a reasonable cost.